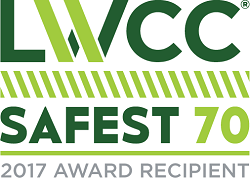 St. Tammany Fire Protection District No.1 has been named one of the "Safest 70" by our Workers Compensation provider LWCC for 2017. With the inherint dangers associated with providing Fire Suppression, Rescue, Hazardous Materials and Emergency Medical response this speaks volumes about the professionalism and safety culture inherint in your fire department! Our commitment to safety has saved our taxpayers as a result of lower premiums for Worker's Compensation insurance.